The above scenario seems a bit futuristic, but is beginning to occur more frequently in institutions with fetal care centers. Posterior urethral valves (PUVs) are the most common cause of obstructive uropathy in males and previously had a progression rate to end-stage renal disease (ESRD) of 50 % . That paradigm may be changing. Improvements in neonatal intensive care, dialysis, and transplantation have allowed some quaternary centers to become comfortable with neonatal ESRD management in these infants. These resource-intense patients require a multidisciplinary approach to management and pose many new ethical and medical dilemmas. 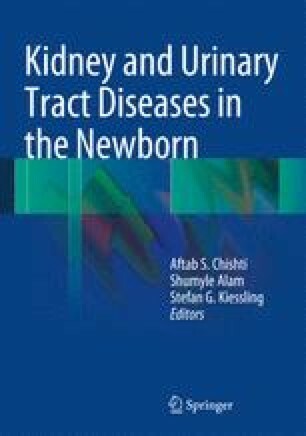 The following chapter will serve as an overview of posterior urethral valves with a focus on the concerns of this growing new population of neonates.